What’s happening at Rotherham District General? Today the Rotherham Hospital Trust Board publicly announced that they do not intend to seek a merger with other local hospitals – at least for the time being. 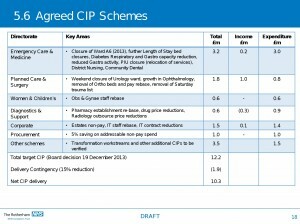 The short media statement – which you can see by clicking here – confirms that the board believe that the hospital can come through its current difficulties as an independent entity, although this will require “the Trust to continue to deliver significant quality and cost improvements each year”. The Trust also confirm that the full details of the plan will go to the government’s NHS regulator, Monitor, by the deadline of December 31st. “The hospital board are right to pursue a plan that keeps Rotherham as a stand-alone hospital working closely with other parts of the NHS. ‘It will be a tough job for the new hospital team because there are still problems from the past to sort out and all hospitals are seeing their NHS funding cut. I hope it means changes in the way the hospital works rather than cutbacks in services that patients will see. I also want to see changes which make the best use of the hospital’s highly-committed staff and avoid forced redundancies. ‘I’m pleased the hospital board have listened to our public campaign and rejected the NHS regulator’s pressure for a hospital merger, and I strongly welcome their aim to keep Rotherham hospital independent. 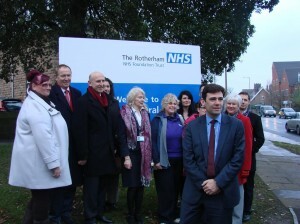 ‘It’s clear that hospital bosses believe they can sort out the finances and continue the high quality NHS services we have in Rotherham. This is the only plan they want to pursue and the top priority now is to persuade the government’s NHS regulator in London to agree. As Rotherham’s three MPs, Kevin Barron, Sarah Champion and I will be meeting Monitor again in the New Year to support the case our hospital submits. ‘However, the board have kept the merger door too far ajar for my liking. I fear Government Ministers have a hidden agenda to see the NHS run by fewer bigger hospitals, so I will also argue that Monitor must allow Rotherham to take a hospital merger completely off the table. Merger would mean NHS decisions and services taken out of Rotherham, and the 2500-name petition we delivered this month to Downing Street shows there’s strong public support for keeping our hospital in Rotherham for Rotherham patients. You can listen to Cllr Hoddinott’s interview on the BBC iPlayer for the next week by clicking here. Rotherham Council’s Health Scrutiny Committee will be meeting with the Hospital Chief Executive and Chair of the Trust Board in January. Hosted by 123-reg, Webfusion Ltd, 5 Roundwood Avenue, Stockley Park, Uxbridge UB11 1FF. Promoted by Wentworth and Dearne Labour Party at 41 Park Grove, Bramley, Rotherham S66 2RZ. This is a joint Labour Party and Unison campaign.